Ignore anyone who claims to know where Britain will be in a week’s time. The New York Times has produced a flowchart for the constitutional mess the country now finds itself in. Unsurprisingly, it’s mindbendingly complex. No one really knows where we go after Theresa May’s crushing defeat in Parliament. The coming days will be filled with excited chatter, behind-the-scenes horse-trading and misleading smoke signals. But while commentators fixate on the tawdry political melodrama, it’s worth sitting back and reflecting on the far wider, systemic weaknesses that Brexit has exposed – and which extend across the European continent. 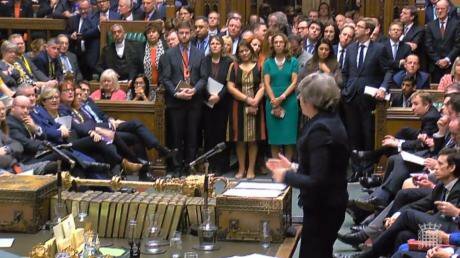 That it has taken two-and-a-half years for Britain’s parliament to start a conversation about what Brexit really means is a damning indictment of a political system that badly needs reform. For Britain, a written constitution and a fairer voting system that builds a culture of political dialogue, compromise and deeper democratic engagement with citizens would be a start. But Brexit has triggered far more than this. Over the past two years, openDemocracy and a small network of investigative journalists have exposed just how vulnerable to manipulation our democratic systems are – in the UK and across Europe. In the UK, there are laws which are supposed to allow citizens to know who funds their politics. But the system is full of holes. My colleagues Peter Geoghegan and Adam Ramsay have exposed how a large Brexit donation to the Democratic Unionist Party was channelled via a secretive group, abusing outdated Northern Irish laws to shield the identity of the donors. Despite mounting calls from politicians, the UK elections watchdog has still refused to launch a full investigation. Along with Carole Cadwalladr at The Observer and others, we’ve exposed how Arron Banks, the largest Brexit donor, misled Parliament and lied to regulators about the sources of his wealth, triggering parliamentary questions on ‘Russian interference in western democracies’ and an investigation by the National Crime Agency. Vote Leave and Banks’s Leave.EU were both found guilty of breaking electoral law, with senior figures reported to the Metropolitan Police. We’ve exposed the connections between the Brexit campaign, Steve Bannon and Cambridge Analytica – and how British taxpayers are funding a hardline pro-Brexit lobby group of MPs. Our work has had an impact. Lawmakers ended donor secrecy in Northern Ireland. Our reporting was cited as evidence by the UK’s influential parliamentary inquiry into fake news, has made headlines across the world, and fed into ongoing investigations by lawmakers in the US and UK. But – what does it all amount to? Britain’s politicians are set to struggle through a constitutional labyrinth that could well lead to another referendum, some time within the next six months. Meanwhile Europe gears up for elections in May which are likely to deliver significant gains to the far right. Both of these democratic processes are plainly vulnerable to the kind of wide-scale manipulation our investigations have found in the original referendum campaign – and elsewhere. Last year, during Ireland’s historic abortion referendum, we dug deep into who was financing and supporting the anti-repeal lobby, and how voters were being targeted on social media, despite Facebook’s promise to ban foreign-funded adverts. The same day that Mark Zuckerberg was assuring MEPs in Brussels that Facebook had sophisticated systems in place to prevent foreign interference in the Irish vote, our journalists were able to circumvent these so-called firewalls in a matter of hours. Multinational tech firms will not protect the pillars of democratic culture if their own profile and profit margins will suffer in the process. Time and again, the tech giants have shown that the regulation of the democratic process must not be outsourced to them. They are part of the problem. Google, for example, has poured millions into its Europe-wide Digital News Initiative, aimed at helping to ‘save’ the news industry. But last May, openDemocracy revealed that Google was one of six companies that had agreed a secret £3 million deal with London’s Evening Standard newspaper for “money-can’t-buy” positive news and “favourable” comment coverage. Editor George Osborne faced widespread calls to resign and the controversial project was delayed. This is just a microscopic example of how vast multinational tech firms will not protect the pillars of democratic culture – be they press freedom, transparency, accountability or the rule of law – if their own profile and profit margins will suffer in the process. So what can be done to prevent a rerun of the abuses of the 2016 EU referendum in Britain’s next democratic contest – whenever that is – and in the EU elections in May? There are short-term solutions that will make a difference. Far heftier penalties for breaking British electoral law would be a start. (Currently, you can be fined more for touting football tickets than you can for subverting Britain's democratic process.) We need real-time campaign spending reporting – so that cheating is exposed before the vote, not after it’s been won. Criminal and regulatory enforcement agencies across Europe must get far greater resources and a wider remit to investigate and scrutinise. Lawmakers, at the national and European level, must compel the tech platforms to be more transparent and co-operate. This is complicated – and will take time – but we cannot outsource democracy to Silicon Valley. Nothing will change if the public doesn’t know what has gone wrong. Most importantly, and immediately, citizens, philanthropists, governments and frankly anyone who has a dime should be giving whatever they can to support investigative journalism that has a proven track record in exposing how those with hidden agendas are seeking to influence what we see, hear and think. Why is this the most important thing? Because nothing will change if the public doesn’t know what has gone wrong. Of course, it’s my job to make the case for openDemocracy (and you can support our work here), but there’s a wider, long-term crisis in the funding of high-quality journalism right when we need it most. We have fresh leads to chase down on overseas links to major players seeking to shape Brexit, and on those seeking to redraw the political map of Europe in May’s parliamentary elections. We are already mapping the networks that are financing and organising key far-right groups across Europe; analysing how their messaging is targeting voters on social media; and exposing how these groups are seeking to circumvent laws aimed to ensure political transparency and to prevent foreign interference. Of course, investigative journalism is not enough. In this age of tech-platform dominance, we also need media which actively and thoughtfully seeks to challenge assumptions and burst filter bubbles. (See Why I voted for Donald Trump, or Stop sneering at Leave voters, they knew exactly what they were doing). We need publishers and platforms committed to helping stimulate a deeper democratic culture, of debate and dialogue, which confronts polarisation head on. Often, the most revolutionary initiatives in this space are happening in local communities, and we need to hear their stories. A film we made in Belfast, for example, shows how grassroots groups are overcoming prejudice and intolerance against refugees and migrants by doing something quite simple: hosting face-to-face conversations. We are part of a very small, under-resourced network of journalists working on stories which have raised a string of vital questions for modern democracy: who gets to shape our elections, and our public conversation. We aren’t doing this because we have a pro or anti-Brexit agenda, or any other political goals or allegiances, but because we believe it’s vital that citizens everywhere know who is seeking to influence what they see and hear, and who has access to key information that affects their lives. If you agree, please consider supporting our work today. Thank you.